Depart from Moshi town and drive 45 minutes to the Marangu park gate for registration. From Marangu park gate we travel to Naro Moru, north east Kilimanjaro, a further 68km and approximately 2 ½ hours on bad roads to the Rongai start point (1996m). Meet your guide and porters before you begin your hike from the Nale Moru village. The small winding path crosses maize fields before entering pine forest, and then climbs gently through a forest. The trail is not at all steep, but is rather a gentle hike through a beautiful country side. The first night’s camp is at Simba Camp (2 626m). The camp facilities include a public toilet and a wooden table with benches, but no hut. 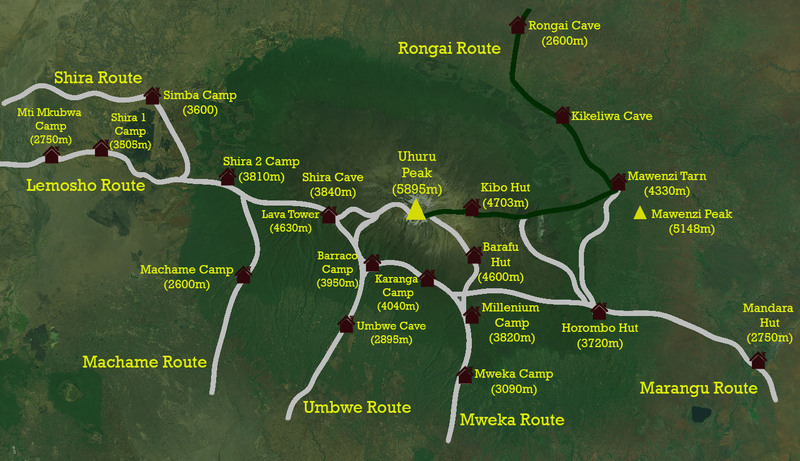 We hike from Simba camp up towards Kibo till 3 482m for lunch at First Caves, a distance of 5.8km. After lunch we continue trekking until reaching Kikelewa Camp at about 3679 metres. The views start to open up and you begin to feel you’re on a really big mountain! Water can be found in a obvious stream below the cave, although you might have to wander downhill a way to find a pool or two. Enjoy dinner and overnight at Kikelewa camp. A short but steep climb up grassy slopes offers superb views of this wilderness area. The vegetation zone ends shortly before you reach your next camp at Mawenzi Tarn spectacularly situated beneath the towering spires of Mawenzi. Spend the afternoon acclimatizing and exploring the area. After breakfast we head west and continue ascending on the east side of Kibo crossing the saddle between Mawenzi and Kibo taking 4 to 5 hours to reach Kibo Hut. The remainder of the day is spent resting in preparation for the final ascent, which begins around midnight. Overnight at Kibo hut. You will rise around 23h20, and after some tea and biscuits you shuffle off into the night, and this is where the going really gets tough. The first section of the trail consists of a rocky path to the Hans Meyer Cave (5150m), also a good resting spot. The path then zigzags up to Gillman’s point (5 681m), which is located on the crater rim. This section is very steep with a lot of stone scree, requiring a great physical and mental effort. This is probably the most demanding section of the entire route. Do the Kili shuffle and move slowly. From Gillmans Point you will normally encounter snow all the way up to Uhuru peak (5895m), the highest point in Africa. Weather conditions on the summit will determine how long you will be able to spend, taking photographs, before the 3 hour descent back to Kibo hut. After a short rest at Kibo hot, you gather all your gear you left behind for the ascent and head down to Horombo hut (3 hours) for your overnight. The return to Horombo hut will seem surprisingly fast compared to the ascent. The total time spent walking on this day is around 14 hours, so be prepared for a very tough day. Later in the evening you enjoy your last dinner (with soft drinks and beer for sale at the camp office) on the mountain and a well-earned sleep, filled with memories and stirring emotions. After breakfast you continue your descent (6 hours), passing the Mandara hut, down to the Marangu gate. It is strongly recommended not to pay your porters any tips until you and all your gear have reached the gate safely. Click here for more info on tips. At Marangu gate you sign your name and details in a register. This is also where successful climbers receive their summit certificates. 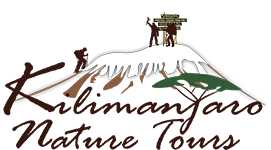 Those climbers who reached Gillman’s Point (5685m) are issued with green certificates and those who reached Uhuru Peak (5895m), receive gold certificates. You now drive back to Moshi or Arusha for a long overdue hot shower, dinner descent bed and celebrations! !